description Toggle all materials to their greyscale values. Selecting GreyScale from the Plugins menu causes all materials and textures in the model to change into the greyscale color. The textures themselves are not removed from the model, but only re-colored. Selecting the Front Face option makes all materials and textures match the currently selected Fron face color as seen in the Edit Styles dialog. 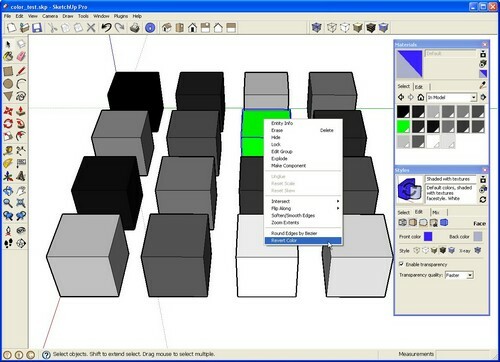 This mode is similar to the Monochrome mode in SketchUp except that textures will remain. By right-clicking in either GreyScale or Front Face mode, individual colors may be reverted to their original values for emphasis. Files may be saved in either GreyScale or FrontFace mode with no problem. When the file is opened again, it will remain in the same mode as when saved, so check the Plugins menu to see which state the model is in, and revert it if desired.